St Mary’s Church. Partly C12, rebuilt early C19. 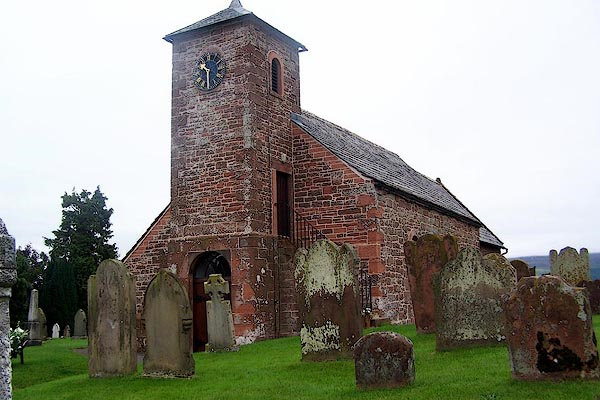 Dressed and rubble red sandstone walls on chamfered plinth and with raised quoins; sandstone and with slate roof. Slender 3-storey west square tower/porch; 3-bay nave has north aisle; 2-bay chancel has north vestry. Early C19 tower has plank doors and semicircular fanlight with intersecting tracery: external stone steps to side door to ringing chamber: clock to west face: pyramidal roof has weather vane dated 1961. Nave has partly medieval walls: filled south door has C19 window with round head, reused zigzag decorated stone to left: former square headed window right now with round head. Wall sundial; small C19 circular window to right. North aisle has 2 C19 small round-headed windows with earlier window to left. Chancel has small pointed lancet to north wall and tripartite C19 east window; lower courses are probably medieval. Interior: aisle arcade of 3 bays has C12 round columns and arches; plain octagonal bowl font is dated 1662. Fittings and furnishings are late C19 or early C20. Stained glass window by L.C. Evetts, 1962.